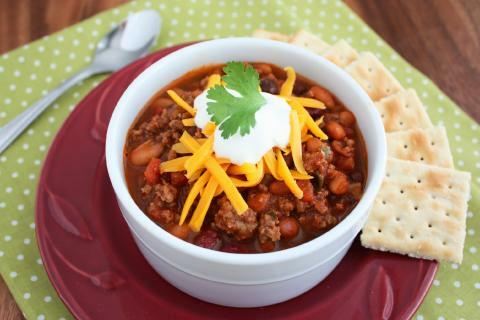 Warm up with this quick and easy homemade chili on a cold winter night. Peel outer layer of onion off and chop. In a large pot, brown beef with chopped onions on medium heat. Add tomatoes and chop tomatoes with spoon, breaking into small pieces. Add seasonings and salsa to beef mixture. Stir in drained, rinsed beans. Cook until hot and serve immediately.